Doesn't it seem like December is flying by? 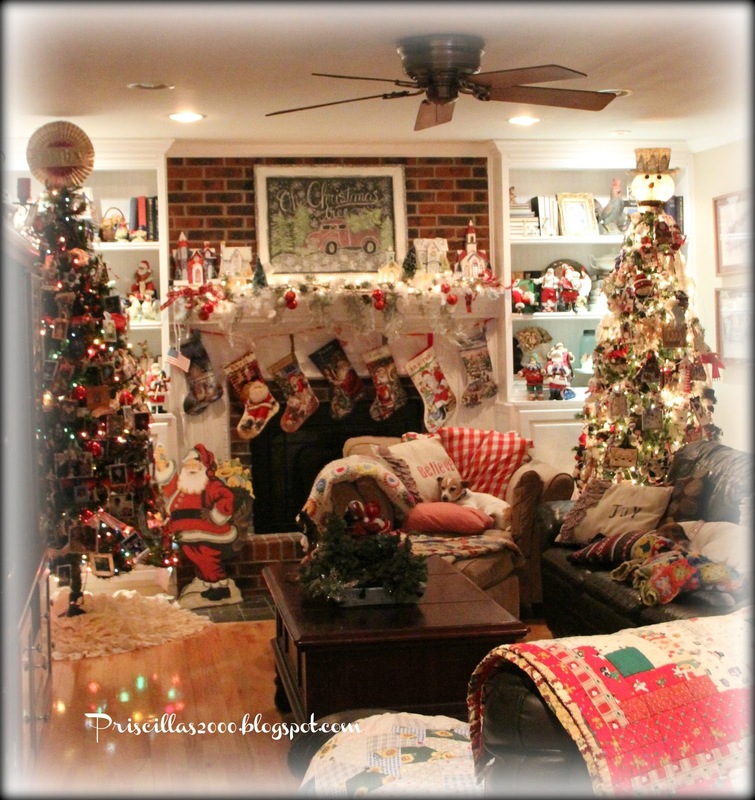 This morning I am here to share 2 of the 4 trees in the family room.. I had the pillows fluffed and the blankets all folded but these 2 had other ideas.. so you are getting the "real" life look! On the coffee table is a Dept. 56 Santa and Mrs. Claus in a horse drawn sleigh.. This was a gift from my sister in law and its one of my favorites! The snowman tree on the right is filled with stitched, handmade and collected snowman ornaments.. You can see one of the photo bomber rearranging the pillows on the chair..
Love Prairie Schooler snowmen! 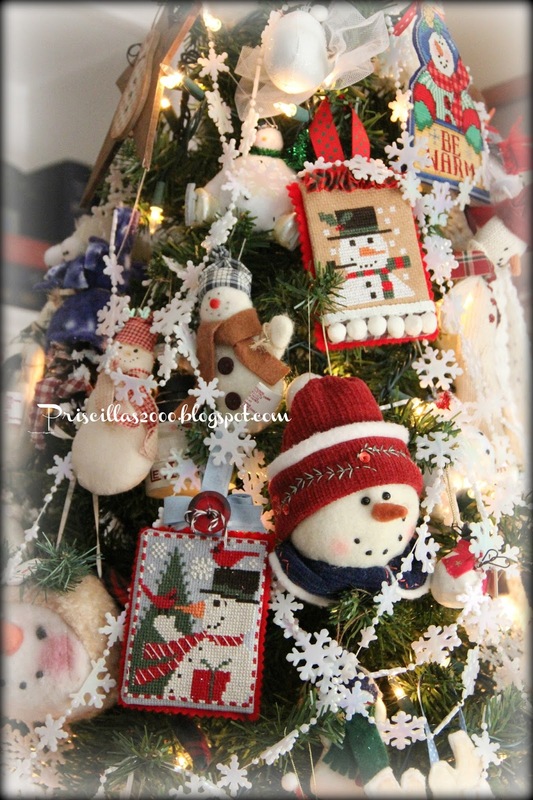 I use lots of snowflake garland on this tree.. 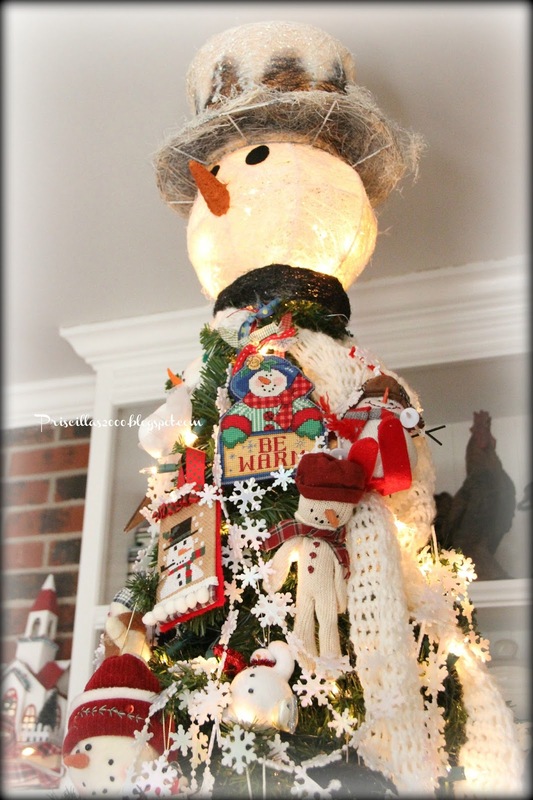 The tree topper is a head off of a snowman ..I crocheted him a scarf which is woven though the branches. 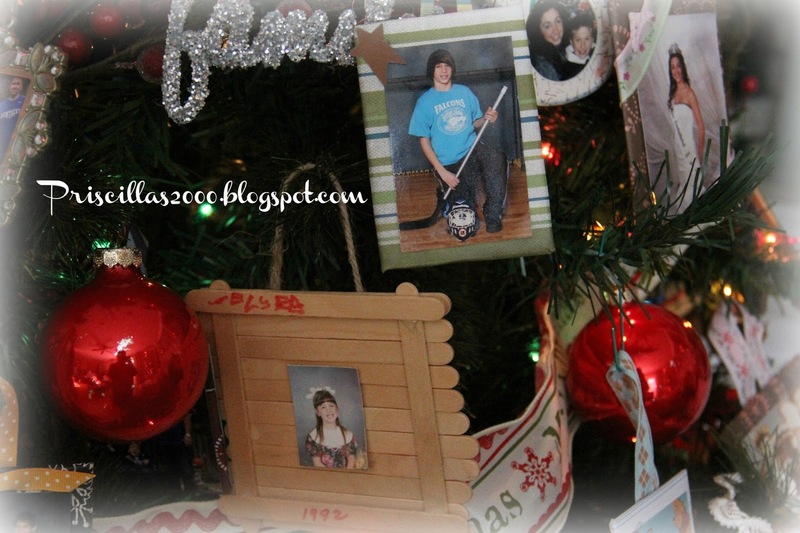 The tree on the left is our "scrapbook" tree.. photos the kids made in school .. little wallet size school photos and special cute photos are all hanging on this tree.. red berry garlands , several differnt ribbons, and red and green ball ornaments with a topper made from scrapbook paper . It rotates so all sides are covered with photos. 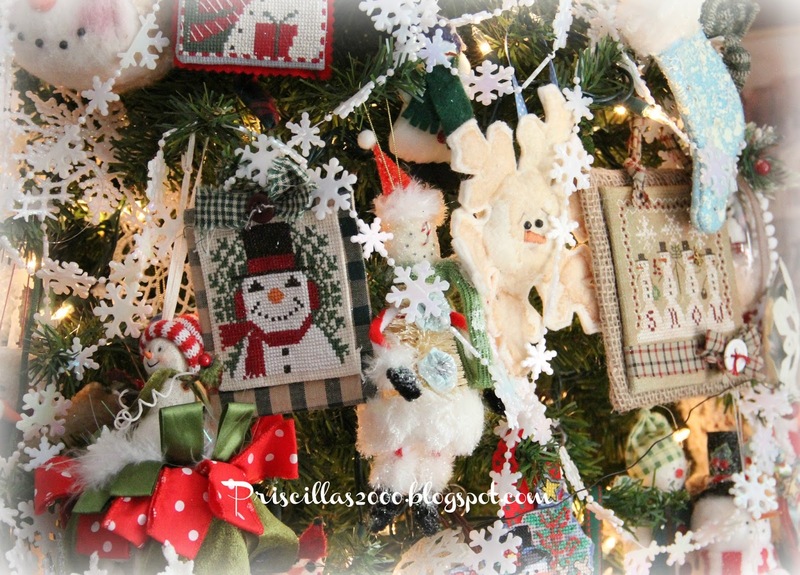 Both tree skirts are ruffled no sew DIY projects.. the scrapbook tree is made from muslin and the snowman tree is different snowman fabrics.. 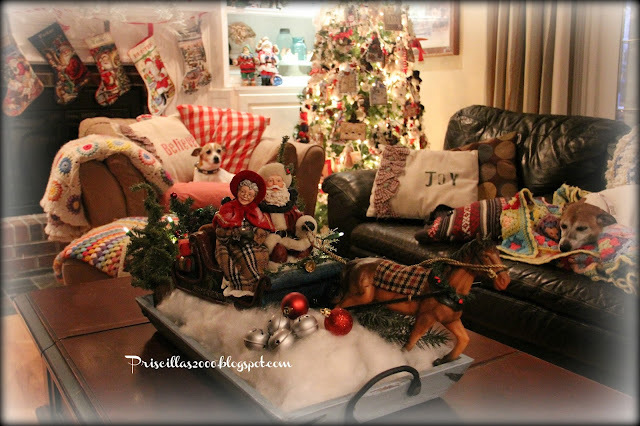 The big wooden Santa is a flea market find .. you can read more about the mantel here.. I like the scrapbook tree, full of wonderful memories. The snowman head topper is cute! Oh Priscilla, your trees are beautiful. 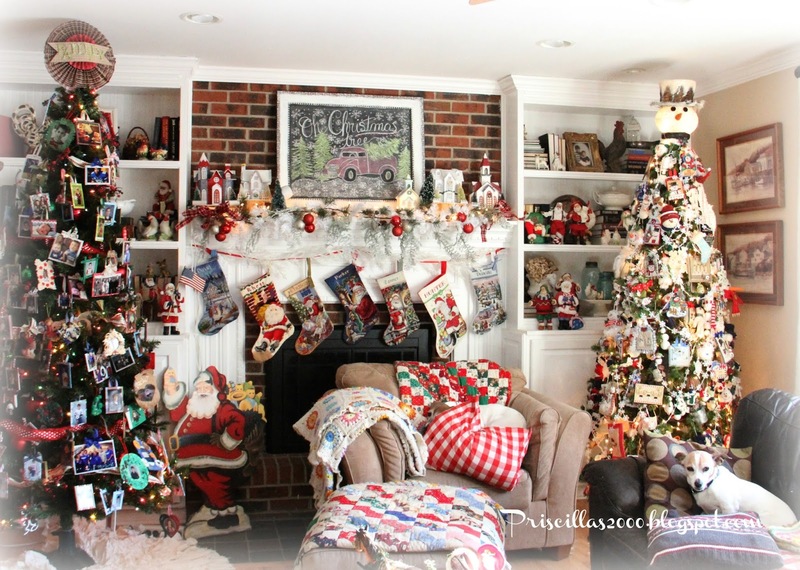 Where do you get all the energy to decorate them and i am sure there are more trees that we haven't seen yet. Looks like your babies want their pictures taken too. They are so cute. 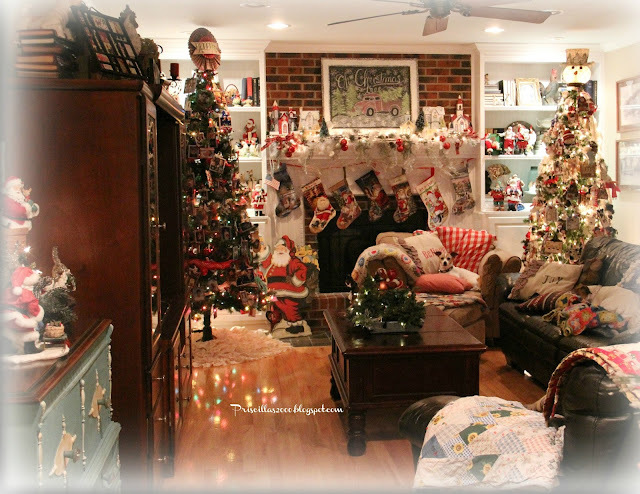 You are definately the QUEEN of Christmas ! WOW ! So festive !! 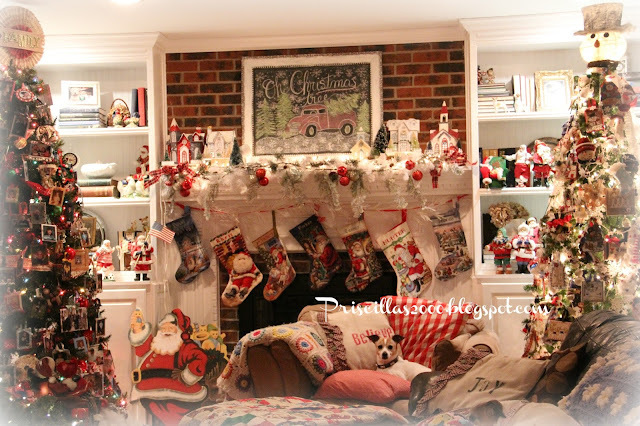 Looks like the DOgS Familyroom to me!! Animals are so special !! 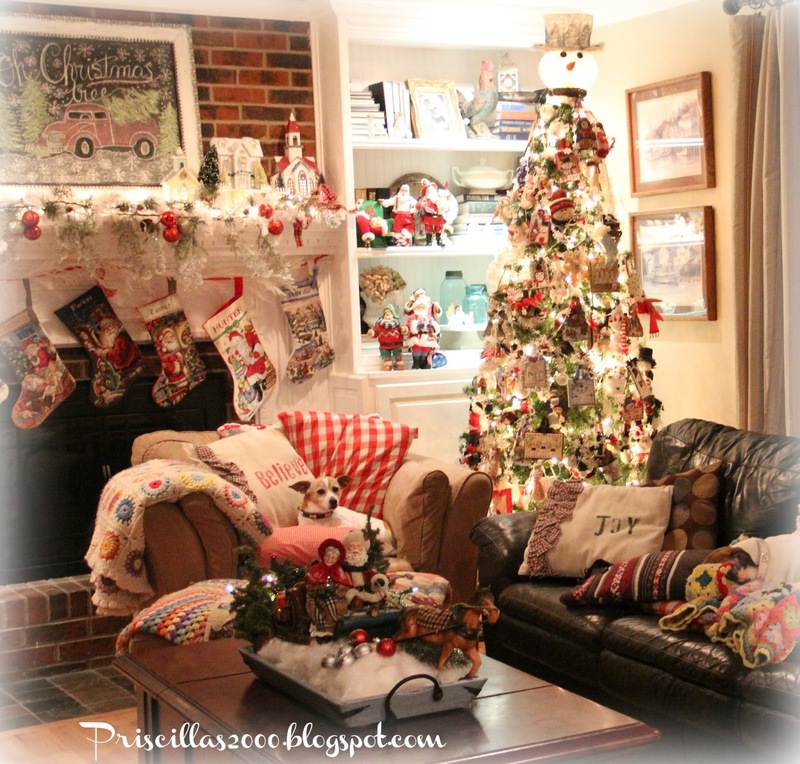 Oh my goodness, I totally agree with the "Queen of Christmas" title, Priscilla! 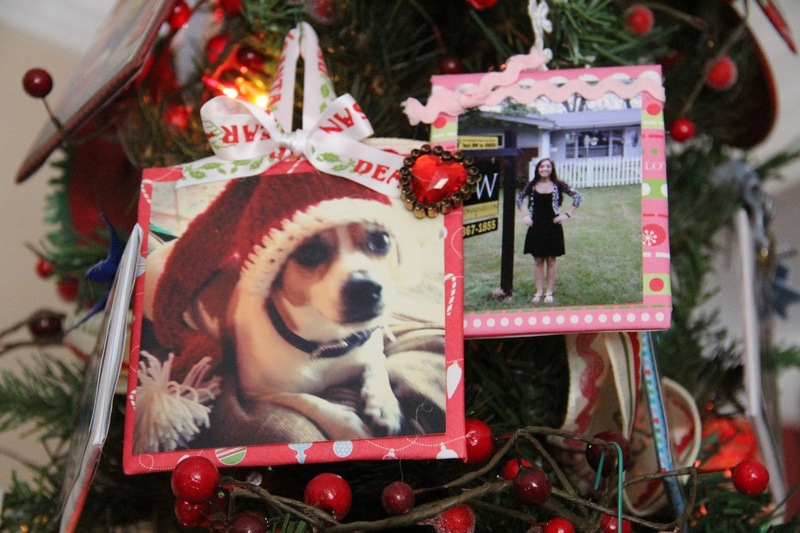 These two trees are amazing, but I'm a scrapbooker, so guess which is my fave?